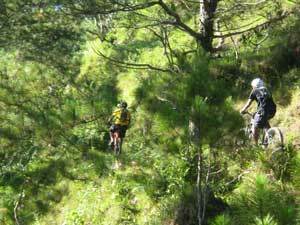 Of all the immediate trails within Sagada, the Bangaan Trail is the only one I haven't ridden. 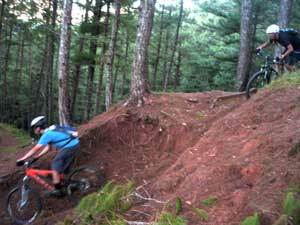 Steve and friends have recently done some trail clearing that just adds one more reason to ride it. 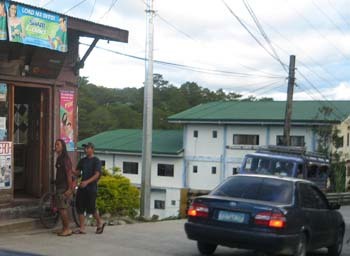 It's the most imposing ridge as seen from Poblacion. 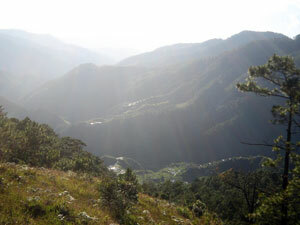 The ridge starts from Danom Lake and extends all the way to the village of Bangaan. 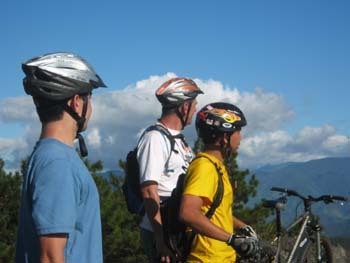 Today's crew was headed by Sagada's in-house hammerhead, Steve, with son Joey and 43Bikes riders, Mike and Ben. 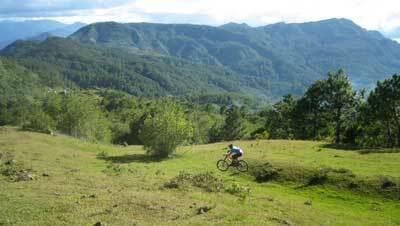 From Poblacion, it's a long continuous climb on the main dirt road up until the Danom Lake junction. Turning left leads down to Danom Lake. 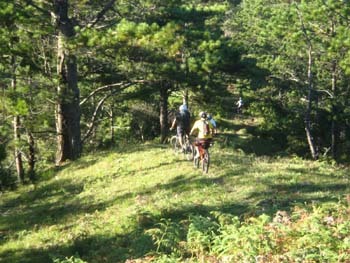 Turning right starts the steep ascent to the ridge. We turned left to chill on the lake. 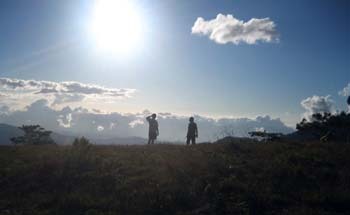 After ascending the steep trail to the top of the ridge, we found ourselves on the plateau that gave us a breathtaking scenery and a playground to fool around with. 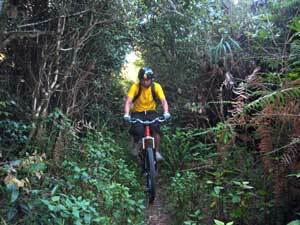 The single-track system consisted of fun narrow trails through varied terrain - fern-covered overgrowth, through the mossy forest, crossing log bridges, short but technical nose dives. 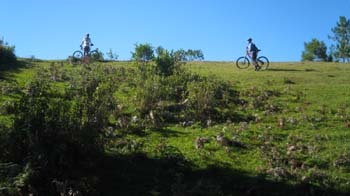 Before portaging the bike down the steepest descent, we were treated to berry picking. 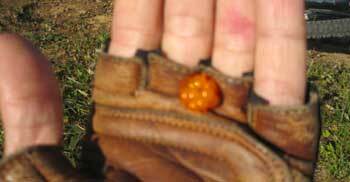 They looked like miniature orange raspberries that exploded in your mouth after a handful - sweet and astringent. 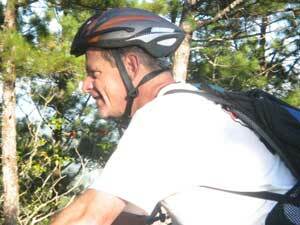 It was one of the many treats this trail system offered for the taking. 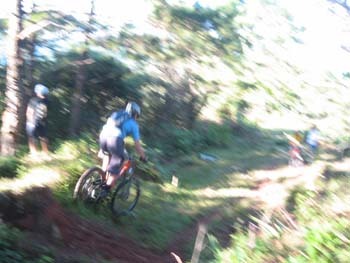 Ok...I just coined this name but it's a fitting one to call this small but ultra-steep downhill shoot at the tail end of the ridge. 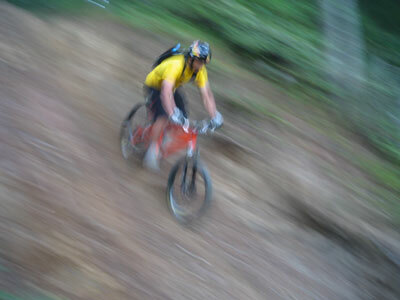 Braking will not stop the bike but cause it to slide down - it's that steep. This is where you separate the men from the boyz. Since I couldn't shake off the possibility of a serious wipe-out, I chose to be a boy. 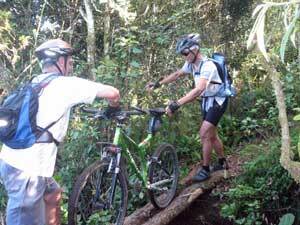 Joey, Mike and Ben displayed their trail-handling virtuosity by barreling down with utmost ease. 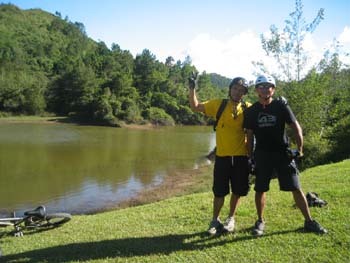 From thereon, it was all downhill on paved road to Bangaan and back to Poblacion. 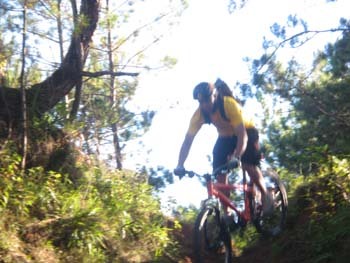 Trail riding along the Bangaan ridge is a blast...probably one of Sagada's best single-track trail system. 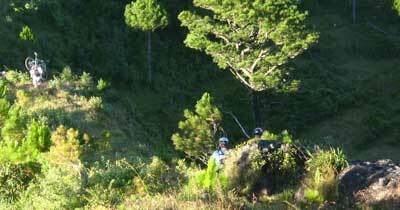 The views are jaw-dropping, the drops are knee-wobbling, the weather cool and chilly, the single-track long and continuous, with numerous sprinkling of technical wake-up-call sections. 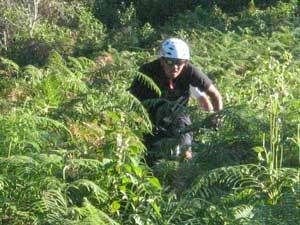 It's definitely a must-experience for any mtb enthusiast. Riding with Ben and Mike was equally a blast. They remind me of Peter Fonda and Dennis Hopper in the cult movie classic, Easy Rider - 2 guys on 2 wheels off on an adventure ride in-search-of... 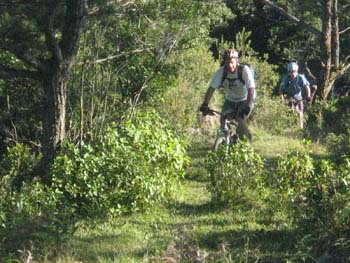 They threw me back to the early grassroots days of mountain biking where intrepid adventurers saddled up and hit the trails for the sheer fun and adrenalin - no podium aspiration, no swaggering around with bling-blings, no beating their personal best....just them, their bikes, and the endless possibilities of the open trails. Hey Steve, thanks again for making it all happen.